The filly has had a busy season but is showing no signs of it, turned out just six days after finishing third behind Mrs Danvers at Newbury. She had also run well behind that rival in the Super Sprint and landed the lion's share of the 300,000 pound prize-money up for grabs on the Knavesmire. Breaking from a seemingly favoured low draw in stall four, she had all her rivals in trouble with fully two furlongs to run. Sean Levey just had to keep her up to her work to hold favourite Rusumaat at bay, which the 13-2 winner did by a length and three-quarters. Savannah's Dream, second in the Windsor Castle at Royal Ascot, returned to form to finish third. Hannon said: "She's done it very well and it was probably her best performance of the year. It's nice to win that race as we're usually second or third. We've knocked on the door a couple of times. "With headgear on she's improved and I think the return to six furlongs has helped as well. "After that performance we'll look at the Firth of Clyde at Ayr. She's owned by a Scotsman so I'm sure she'll take her chance up there." 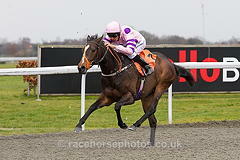 Levey said: "It's a big pot, the blinkers have revived her and I'm delighted she's put her best foot forward. "I've rode her an awful lot this year and I knew she'd stay going to the line, so I just wanted to get on with it early. "We put them to bed early and let her grind away to the line."